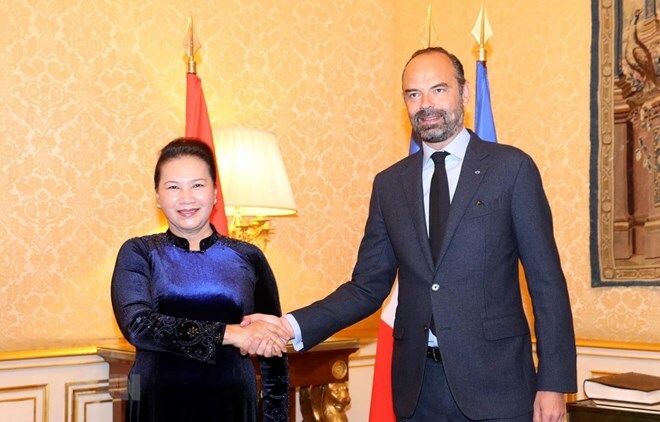 Paris (VNA) – National Assembly (NA) Chairwoman Nguyen Thi Kim Ngan met French Prime Minister Edouard Philippe on April 2 as part of her ongoing visit to France. The Vietnamese NA leader said that her visit – the next in a series of high-level visits by leaders of the two countries, including the France visit of Party General Secretary Nguyen Phu Trong and the Vietnam visit of PM Edouard Philippe in 2018 – shows the sound relationship between the two countries and opens up new cooperation prospects in economics, defence, culture, and education. She said that following the PM’s visit, many French firms have conducted investment and business activities in Vietnam. The Vietnamese newly-established carrier Bamboo Airways is negotiating with Airbus on aircraft purchase, while the Vietnam Airlines and Vietjet Air will receive their airplanes from Airbus on April 3, she said, adding that FPT Group will soon be opening its representative office in Toulouse. She said that thanks to regular visits of Vietnamese and French leaders, as well as the promotion of political-diplomatic cooperation, new economic partnership opportunities have been opened up for the two countries. The top legislator affirmed that Vietnam pays great attention to cooperation with France in Europe. In her meetings with leaders of the Senate and National Assembly of France, she proposed that the French parliament urge the European Parliament to soon ratify the EU-Vietnam free trade agreement (EVFTA). For his part, PM Edouard Philippe conveyed his delight that the business communities of Vietnam and France have fostered their partnership. He said that during his 2018 visit, he discovered that Vietnamese and French firms share the same wish to connect and partner with each other. Along with aviation and aerospace, Vietnam is interested in cooperation in the satellite industry, the French PM said, adding that French businesses, with strength in technology and experience, can be good partners in the field. Noting that the Vietnam-France joint project to build metro line No.3 in Hanoi is progressing, he said that 2019 is an important stage for the project. The French Space in Ho Chi Minh City is a symbol of the Vietnam-France relations, he said, expressing his hope that the work will be constructed soon. Regarding the EVFTA, he affirmed that France will always support Vietnam and hopes that the deal will be signed and ratified soon.